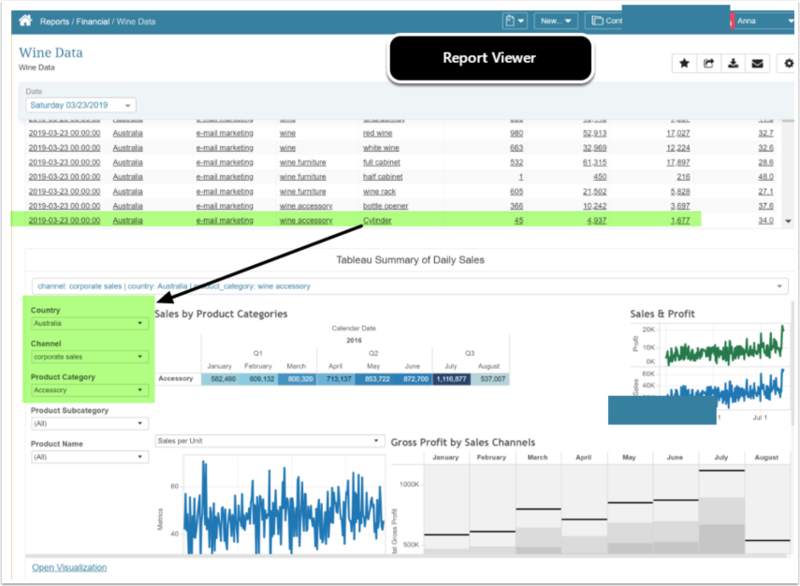 As of Release 5.3, Metric Insights offers new dynamic Reporting capabilities, with the release of 5.5, that functionality has been expanded. 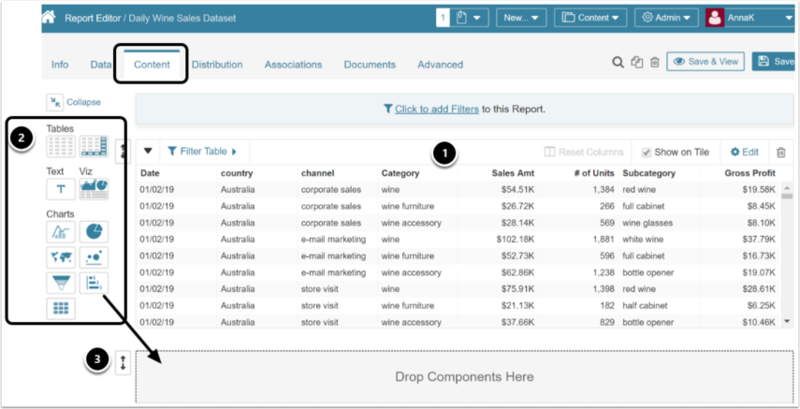 Dataset Reports are now in feature parity with Legacy Reports. 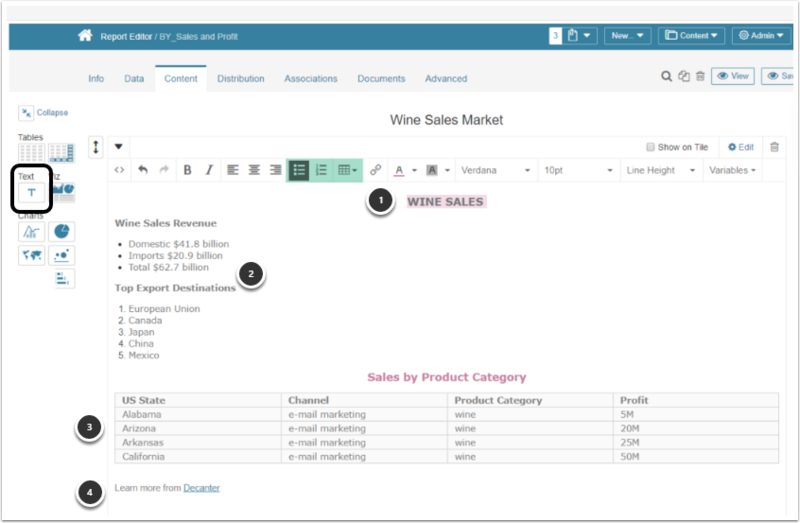 This article gives a brief overview of the range of expanded Reporting options available in Release 5.5. (New in 5.5) Simply select the [Build Report] icon from the Data tab of the Dataset Editor. This option will use the 'All Data' View by default. Click [Show Data] This will also validate the report. 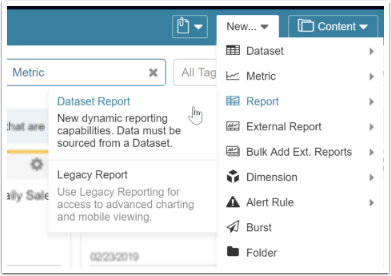 Your Report is now ready to view, but you will probably want to apply some of the Report Formatting option available in the Report Content tab. 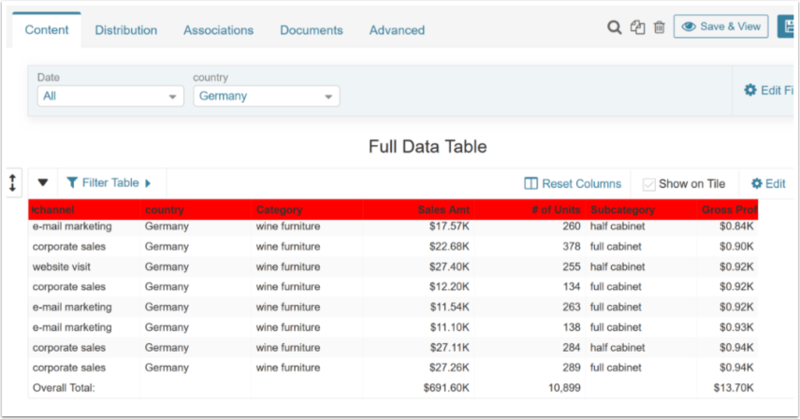 A full Report Table will be set up with the formatting applied in your Dataset (if any). Selecting Edit for any object will produce a slide-out Editor. The corresponding Editor will slide out from the right based on icon selected. 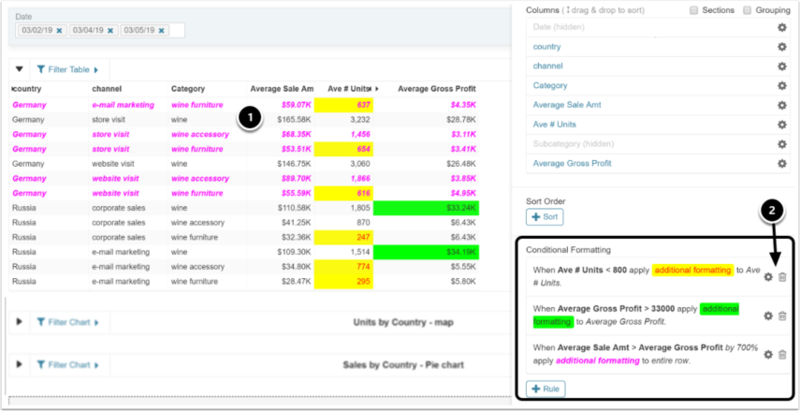 Specify which Chart or Table will appear on the Homepage tile by activating the Show on Tile option. Only one object will be allowed, any other checkbox will be de-selected. Report Filters work much like the Dimension filters but allow greater diversity. These drop-downs apply to all elements of the report and can be adjusted by anyone viewing the Report. 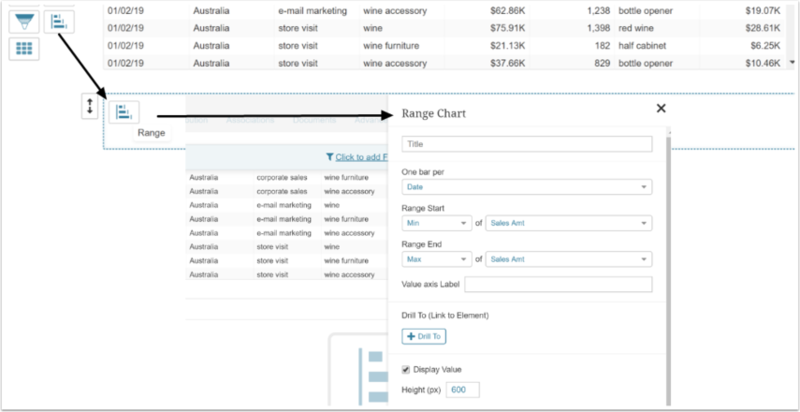 Table (or Chart) Filters are defined by the Report creator, apply only to one object, and cannot be manipulated by Users. 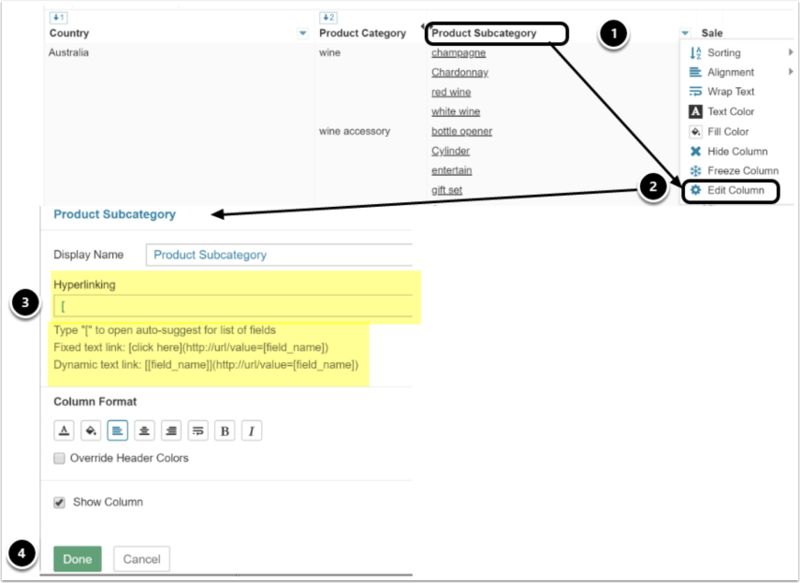 Sections and Grouping provide an easy way to customize your Table for easy viewing. Sections provide the ability to specify an external break column (sections) for a report grid so that tables can be shown one per value of the column. 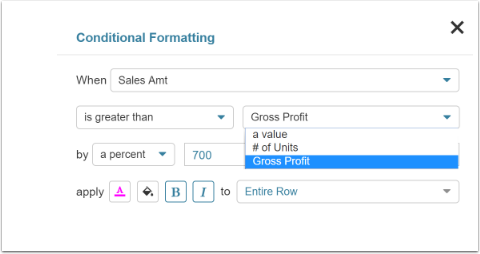 Grouping provides the ability to specify that a column should group values. When set, the column values that are repeated are instead shown as a blank. To edit individual Columns, open the drop-down next to the Column name. You can easily Sort or Hide the column, apply Text and Fill color, etc. Or you can Edit Column to slide the full Column Editor. 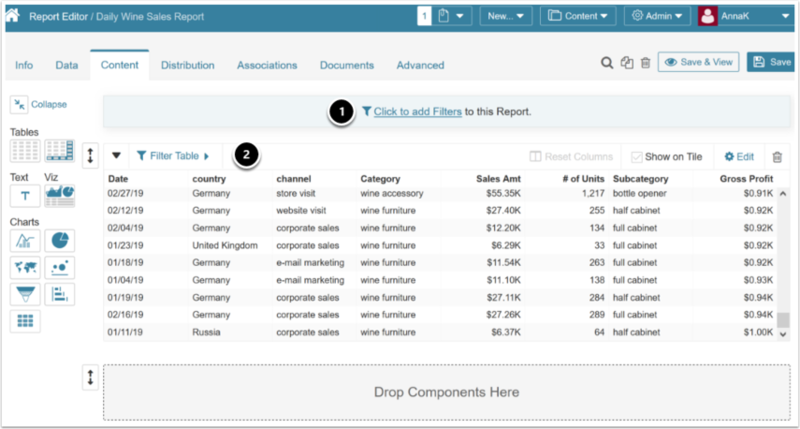 Users can now add blocks of text to your Dataset Reports to make them even more informative and compelling. 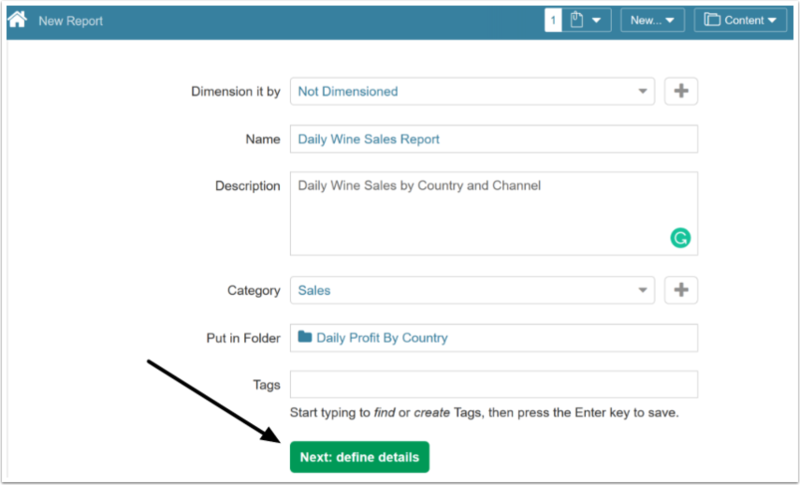 To use this option, drag the Text tile to the Report Canvas and add the required text information. 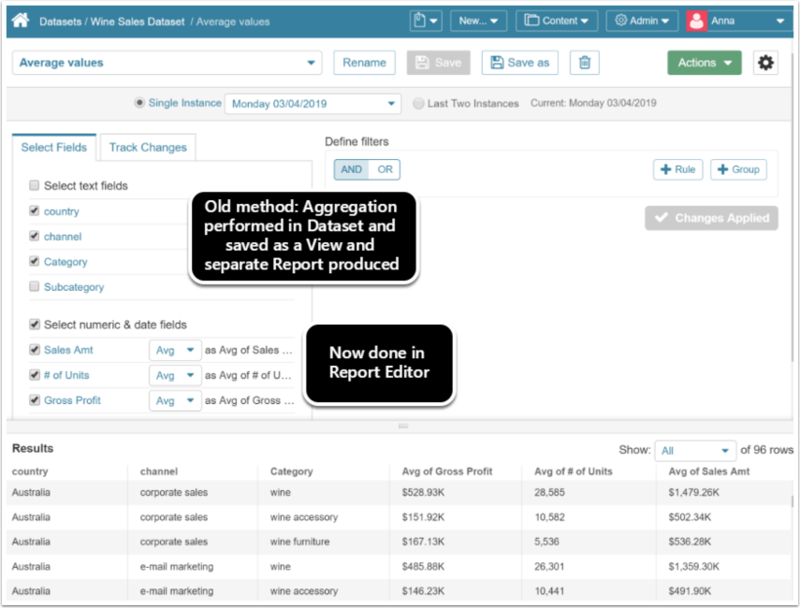 In earlier versions of Dataset Reports, if you wanted to Aggregate values in your Report, you needed to create a new Dataset View with required Field Aggregations and then create a new Report from this. 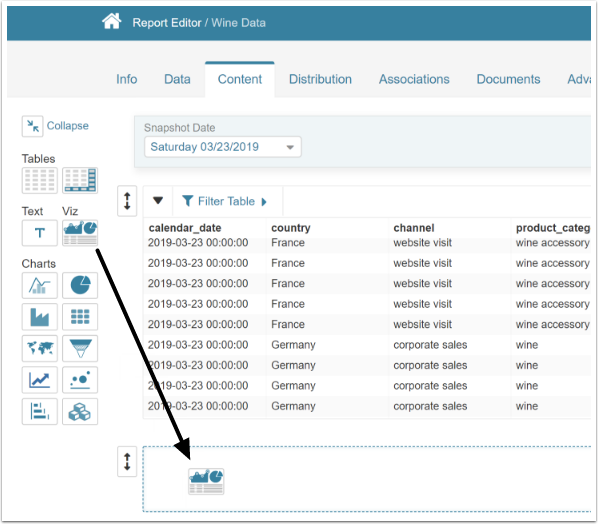 In 5.5 you can perform this in the Report Editor for multiple Tables simply by setting the Aggregation method at the Table column level. See how here Aggregation of numeric values. 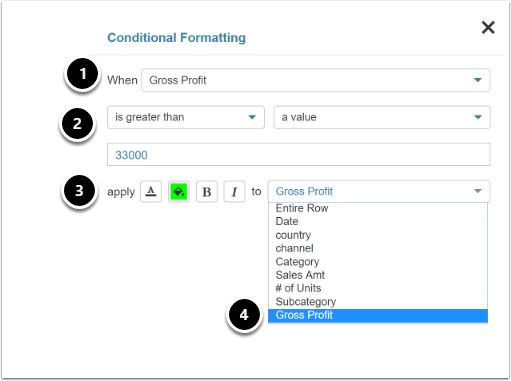 You can choice to compare and format any of your data fields; the options available will differ for text, date, and numeric fields as a couple of examples below illustrate. Select both the condition, and either value or another data column. 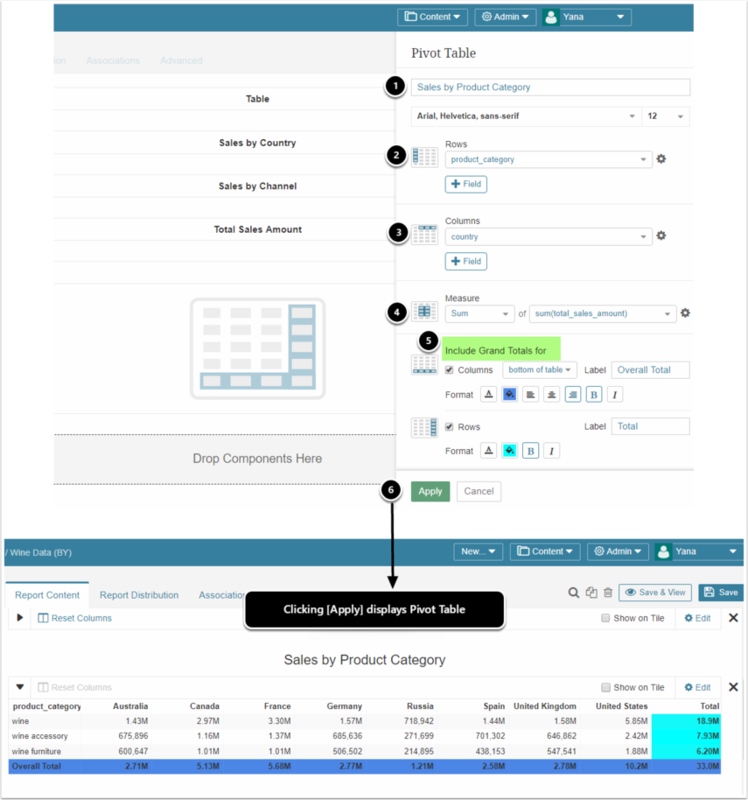 Your options in the drop-downs will vary based on both the Data and Condition chosen. [Apply] to produce the Report layout viewed on the left. Rules can be edited or deleted via icons viewed here. 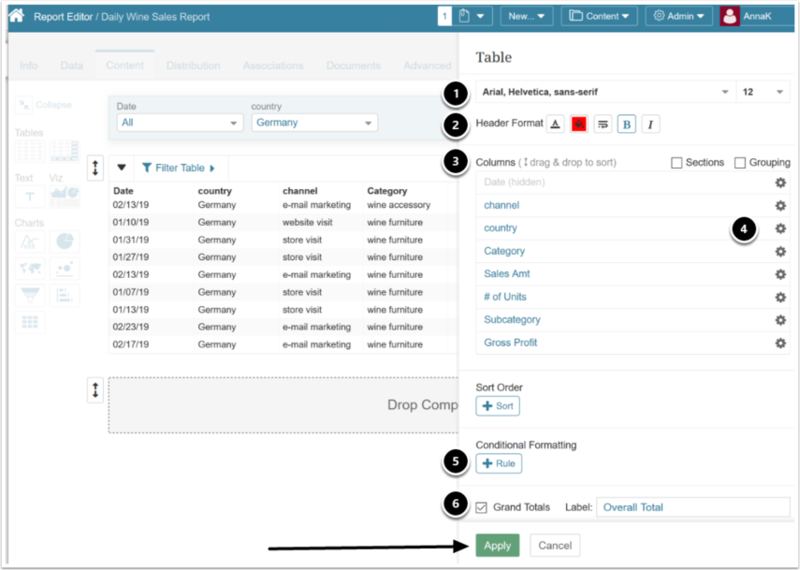 Pivot Tables function much like other Tables in the Report Editor, but provide fewer options, especially when applying Conditional formatting as this can only be done at the Column level. There are numerous charting options available by simply dragging-and-dropping one of the Chart icon(s). A slide-out will appear from the rights allowing you to select your options. 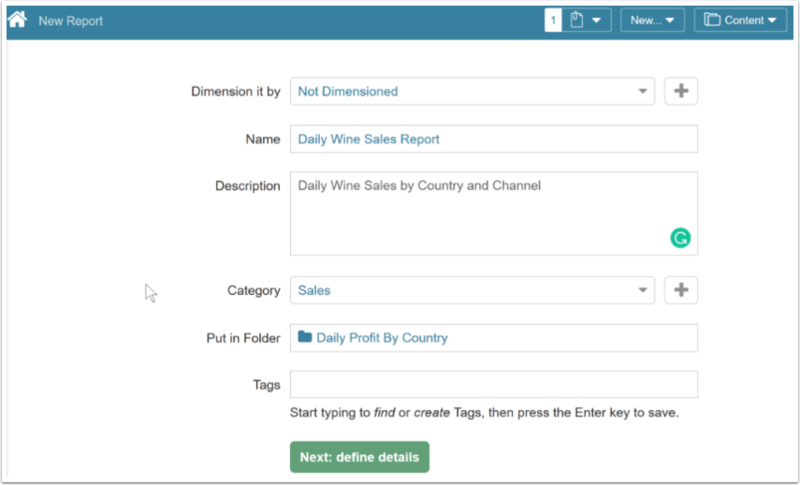 Users can now add blocks of text to your Dataset Reports to make them even more informative and compelling. To use this option, drag the Text tile to the Report Canvas and add the required text information. More details on using Text Blocks can be found here. 10.2. 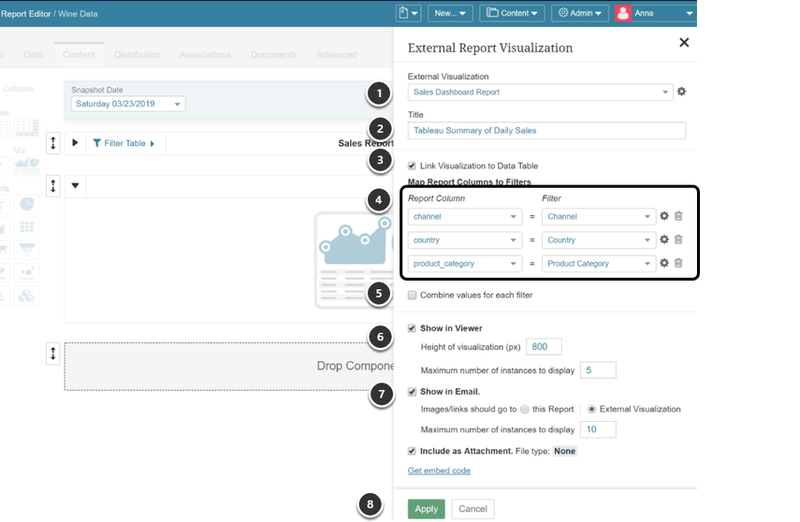 Chose your External Visualization and Click "Link Visualization to Data Table"
From the drop-down, choose External Report Visualization with which your Dataset Report will interact. 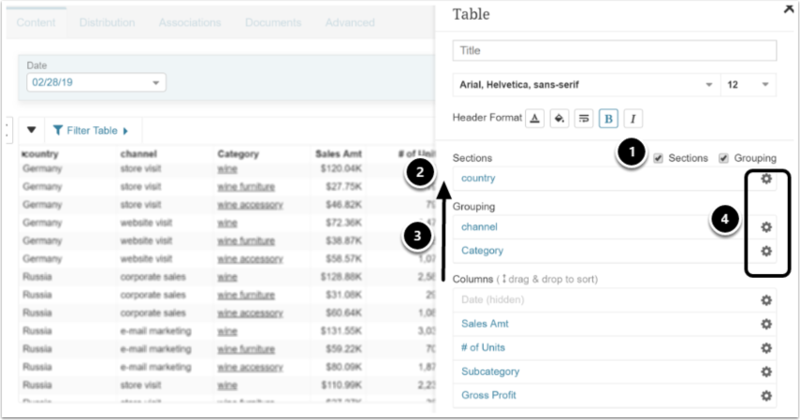 "Link Visualization to Data Table" to link Column Values to a Visualization. In the Dataset Report Editor, when you click such a link, the Visualization will open on an external webpage. 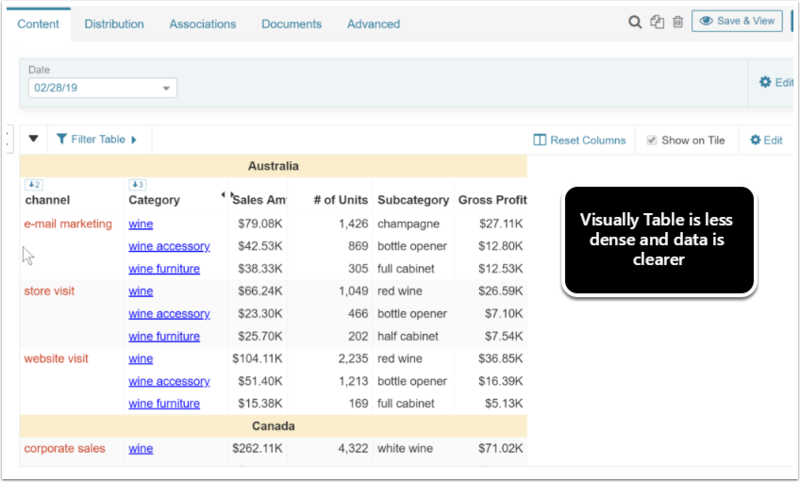 In the Dataset Report Viewer, when you click the table link, the Visualization will open in the Viewer. Map Report Columns to Filters. 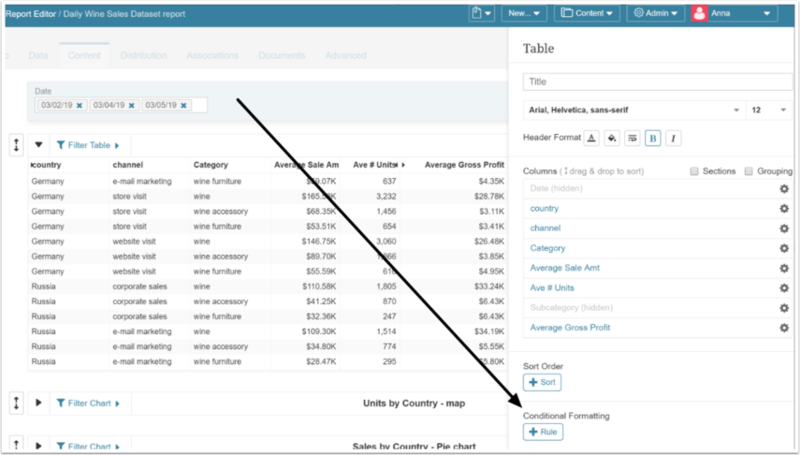 Clicking [+Add] allows mapping more Report columns to External Filter values. 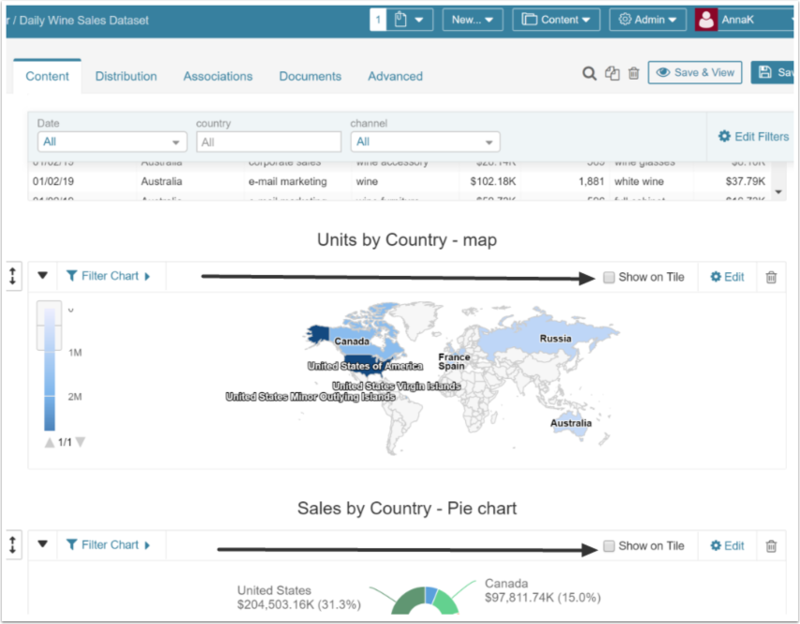 If you are not linking to an External Visual contained in your Report, you will need to link each field individually. 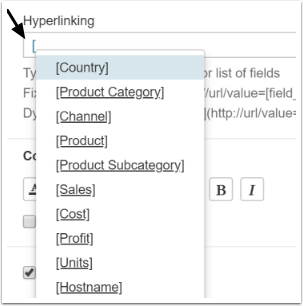 Basically, you edit the field where the link is being located and manually enter the Hyperlink code to access it. This is more fully explained in Creating Hyperlinks in a Dataset Report. If you are linking to a External Visual, this process is automated. See details above at External Visualizations and Hyperlinks. 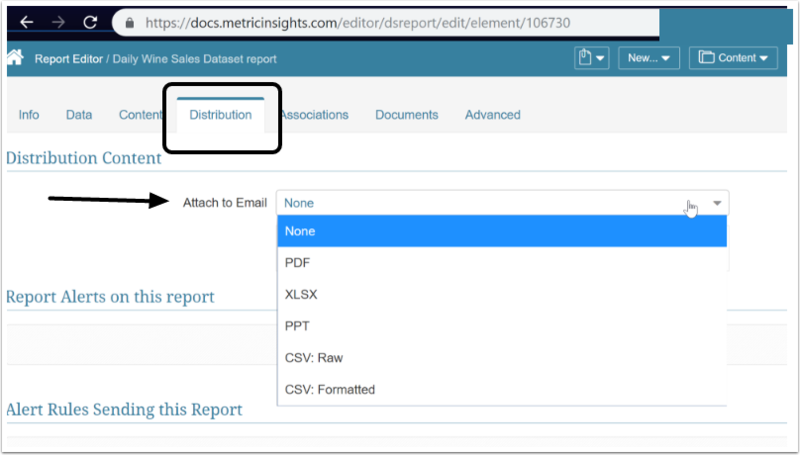 If you have chosen to include any Attachments to your report, you must specify the format in the Report Distribution tab. Note: This setting will apply to all Charts and Tables electing to include attachments.